"Black Magic Woman", is from a live painting session with our lovely model, Mia. She sat the entire session (morning and afternoon) with her beautiful 'bewitching' smile. I am so happy with the light and color on this piece, it practically glows in the dark! 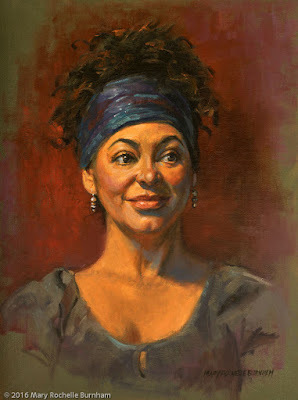 If you are in Phoenix this Friday, come to the opening of the Portrait Artists Of Arizona show at the University Club. I have three pieces in the show.